Proper blood circulation is essential to maintaining the health of all tissues in the body by supplying fresh oxygen and nutrients and carrying waste materials away. Poor circulation in hands and feet could lead to tingling feeling in those areas, cold toes and fingers, bluish color in the extremities and pain. Those most susceptible to poor circulation in feet and hands are the elderly, those with diabetes, overweight individuals, and pregnant women. The symptoms of such circulation problems is most often ignored and thought to be an insignificant health issue. What many do not realize are the risks involved with the underlying reasons of inadequate foot circulation. Although it’s best to consult a doctor about the actual causes of poor circulation in a certain case, there are also measures to be taken to increase foot circulation as well as blood flow in other areas of the body. 1. Get your body moving on a daily basis. Whether walking, jogging, biking, or dancing, any such activity will increase blood circulation throughout the entire body. If walking is the choice of activity, begin at a pace fit for you and gradually increase as your stamina allows. For pregnant women or seniors with achy joints, low impact activities such as yoga or swimming are best suited to maintain the healthy blood flow. 2. Improve your diet. Poor diet is among the top paresthesia causes, or causes of numbness and tingling. Initially it may not seem so but diets high in cholesterol over time cause plaque to settle on arteries and vessels making it hard for blood to flow freely. Moreover, poor nutrition may lead to diabetes which is among the number one reasons for peripheral neuropathy causes in the US. Besides exercise, diet is an important factor in the fight to increase circulation. Avoiding hydrogenated fats and incorporating ample amounts of healthier monounsaturated fats such as avocados or Omega 3 rich wild salmon are one of the foundations of diet to increase foot circulation. 3. Kicking the smoking and excessive alcohol consumption habits is one of the top methods to increase foot circulation. Both smoking and drinking play a role in elevating cholesterol, constricting blood vessels, and hardening the arteries. Moreover, gradually toxin build up leads to even greater nerve damage causing pain in the feet, loss of motor function and even paralysis. 5. 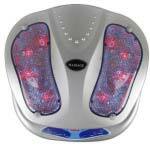 Elevate your feet above the level of your heart several times throughout the day to increase foot circulation. When returning to a normal position after raising your feet for a while, blood that is newly oxygenated will make its way down to the lower extremities and increase foot circulation. At night it is advisable to sleep on the side vs. stomach or back, as the latter can put pressure on the vena cava, major vein carrying blood to the heart.